HTC Evo 4G LTE comes with the latest version of the Android web browser. Coupled with the HD display and powerful processing power of the Evo, the stock ICS web browser performs without hiccups. Naturally, the HTC Evo 4G LTE has full Flash support, so playing Flash videos was a walk in the park. Flash games work like a charm as well. The HTC Evo 4G LTE features the usual set of organizer applications, to go with a mobile office app, capable of both viewing and editing documents. The HTC Evo 4G LTE features an alarm clock application, which can handle multiple alarms, each with its own start and repeat time. You also get a stopwatch and a timer in the same app. The Stocks application gives you quotes from Yahoo finance. You can use the Stocks lockscreen too. The Voice recorder might be quite useful for making audio notes and the weather app brings Yahoo's weather forecast for your area a click away. The HTC Evo 4G LTE has a built-in GPS receiver, which managed to get a lock in under a minute (with A-GPS switched off). If all you need is a rough idea of where you are (within 150 meters) you can use the Cell-ID and Wi-Fi network lock, which is very fast. 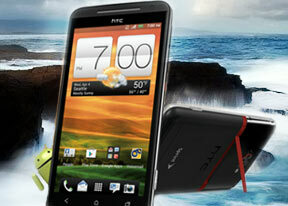 HTC Car is the navigation solution, which comes preloaded with the Evo 4G LTE. It works in landscape mode and uses Google Maps. It is quite handy, as long as you purchase a car dock accessory.